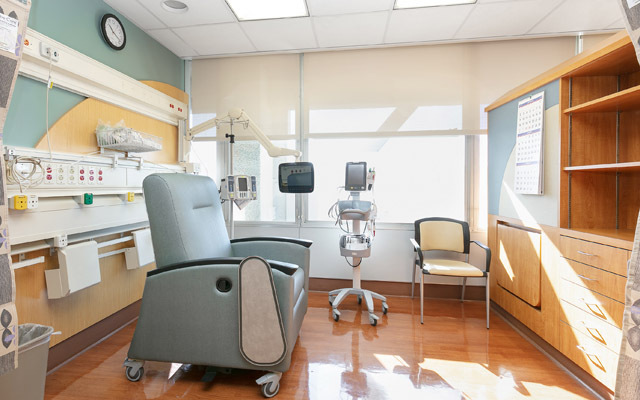 In addition to a new multispecialty cancer clinic, UC San Diego Health expanded its infusion center from six chairs to 20 for both oncology patients and others in need of infusion services. Living with cancer means frequent visits to the doctor during a time when illness can be debilitating and utterly exhausting. To make it easier for patients to receive world-class care from San Diego’s only National Cancer Institute-Designated Comprehensive Cancer Center, UC San Diego Health has added a new multidisciplinary cancer clinic in Hillcrest, staffed with physicians who specialize in some of the most commonly diagnosed malignancies. “In addition to standard infusion treatments, enhanced infusion capabilities at UC San Diego Medical Center allow us to provide Lutathera, a new FDA-approved drug to treat neuro-endocrine tumors, as well as Radicava to help with recovery following stroke and to treat amyotrophic lateral sclerosis (ALS),” said Rebekah White, MD, surgical oncologist and clinical medical director for cancer services at Hillcrest.